Kirsten Atkins has been on skis since she was four years old and shussing down Killington’s slopes in Vermont, where she got her first season pass in 1972 at the age of seven. Kirsten graduated from high school in 1983 and moved to Killington so she could ski more and take advantage of the drinking age, which was 18 back then. To support her ski habit, she worked as a cocktail waitress at a dance club for a couple of years. After her two “gap” years, Kirsten enrolled at the University of Denver and moved to the Mile High City. Her first thought was that she wanted a career in hotel and restaurant management. “But then, I was taking all these anthropology and psychology classes and realized I was more passionate about those studies than my business classes.” In her freshman year, she opted out of skiing in order to get serious about studying. She quickly realized that was a mistake, which she corrected the following year by taking the winter semester off and moving to Steamboat. When she returned to her classes in 1987, her friends decided that taking the winter semester off to hit the slopes was a brilliant idea; however, Steamboat didn’t allow snowboarders and her buddies were riders. Kirsten responded to an ad in the paper for volunteers for the Crested Butte Physically Challenged Ski Program, which was the precursor of the Adaptive Sports Center. The program was born in February 1987 and Kirsten joined up with the fledging organization that November. Some of those first pieces of equipment are conserved in the Crested Butte Museum. “I’m the program pack rat,” Kirsten laughs and explains that the history and development of the Adaptive program, its origins and how it evolved, are extremely important to her, and it’s important to educate the public. This year, the ASC celebrates its 30th anniversary of improving the quality of life for people with disabilities through outdoor adventures. They’ve developed policies and guidelines born out of the experience of its three decades. Kirsten recalls that in the ASC’s embryonic start, she didn’t have a lot of mentors and they had no trainers, yet the mentors who were there taught her well. New employees and volunteers at Adaptive now go through rigorous training in a variety of skills before they are allowed to take out a lesson. She spent a couple of winter months in Argentina for 10 consecutive years, focusing on teaching the instructors and volunteers and helping them groom their own programs. 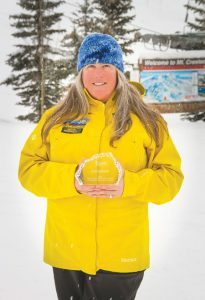 “I was focusing on an education curriculum for the instructors there and we developed an instructor certification program and helped facilitate the Argentine Ski Instructor Association,” Kirsten explains. ASC began to take its own USA clients to Argentina as part of their Adaptive Adventure Travel program in early 2000. The group program has expanded and the groups are now the backbone of their program. There are various disabled veterans’ groups, like Operation Rise and Conquer, which is one of the veteran programs funded through ASC and through generous donors. There is the Roger Pepper Camp for teenage burn survivors, one of the long-running camps of Adaptive. From the teen burn survivor camp comes the DC Burn Foundation, a firefighters’ group of survivors. “We have groups that come from rehab hospitals with spinal cord and head injuries and also various research hospitals that work with MS and multiple disabilities. We have tons of different kids’ groups. A couple of weekends ago we had a group called Joy School in Texas—they’re children with learning disabilities. A lot of the groups come both summer and winter,” Kirsten says. Summer programs offer biking, water sports, like canoeing on Irwin Lake, or camping, hiking, and rock climbing (they have ice climbing in the winter). This past December, Kirsten was honored with an induction into the Disabled Sports USA Hall of Fame. It’s an online national recognition that acknowledges the efforts of both athletes and instructors throughout the entire country, inducting one athlete and one instructor each year. Kirsten feels that there are many more sports that can be expanded to enrich the lives of the disabled. And after 30 years, she’s still there to help create that.